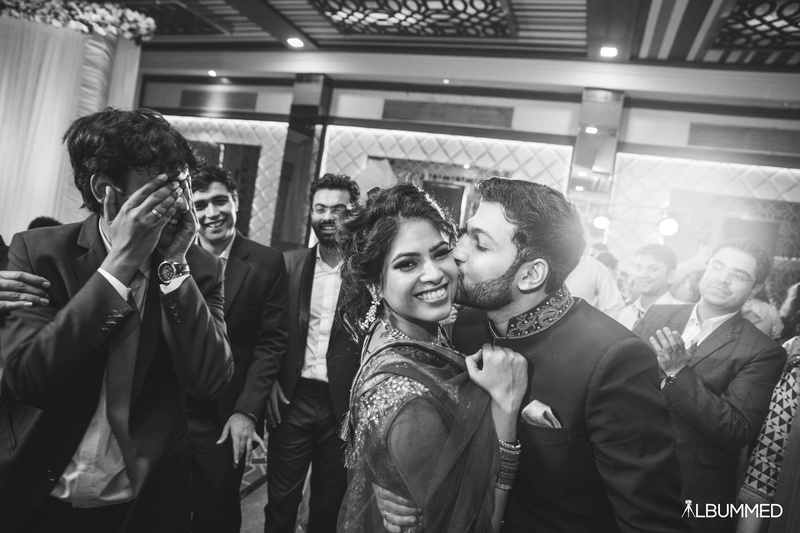 A couple no different than a 90s Bollywood movie, Anjali (Arpita) and Rahul (Vedant) met each other when they were still teenagers. 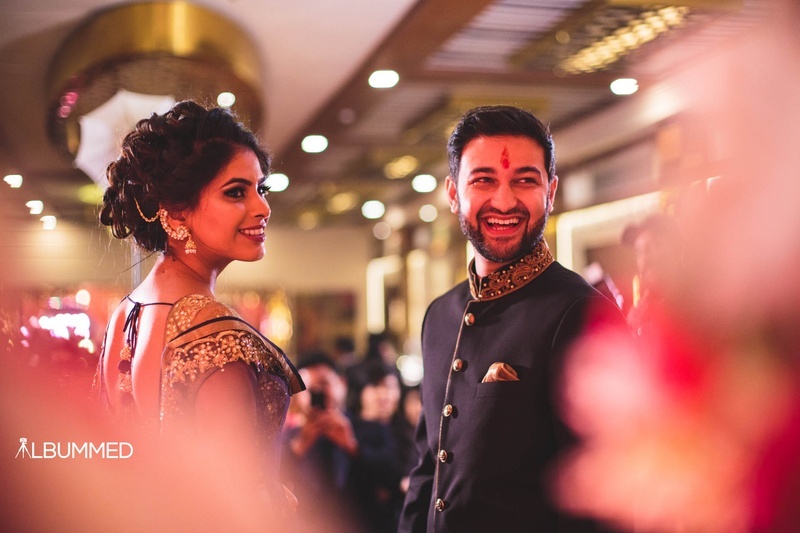 Just like “Kuch Kuch Hota Hai” both were the best of friends. 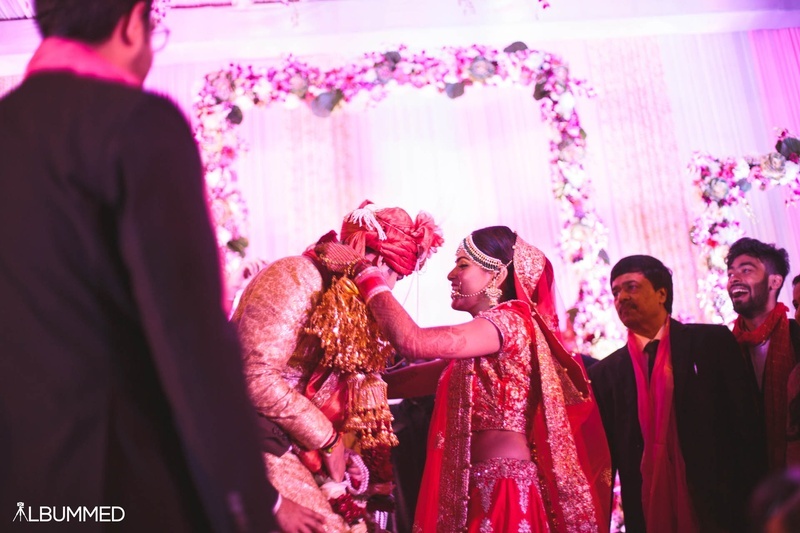 A story without any twist, read (Tina), it has got all the flavours of a perfect journey from friendship to marriage. 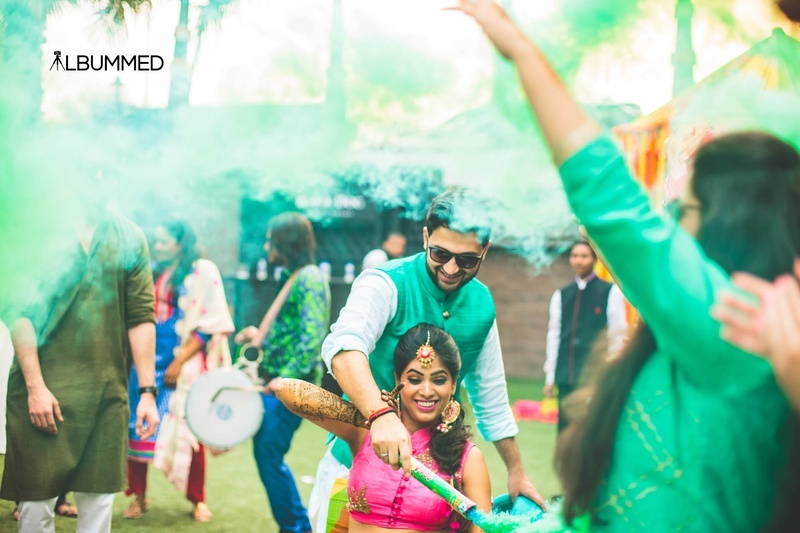 Deep down, Anjali had already fallen for Rahul and hoped for him to see that. 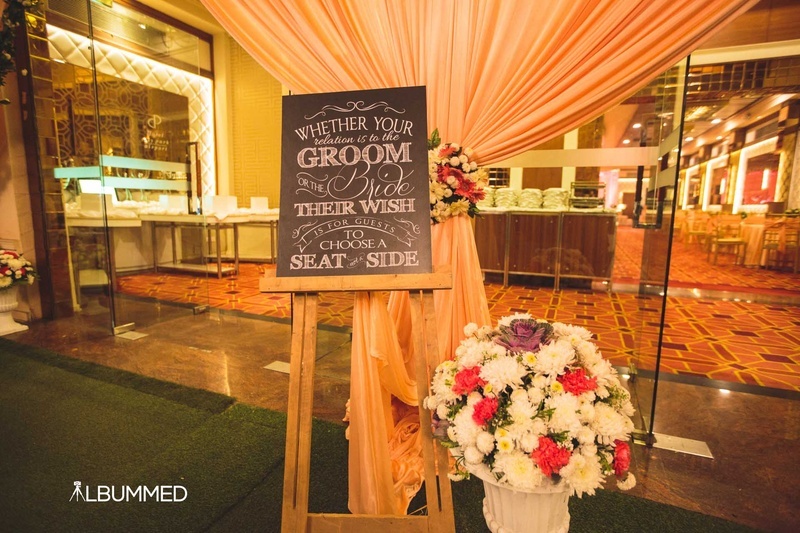 He took some time to come around and guess what? 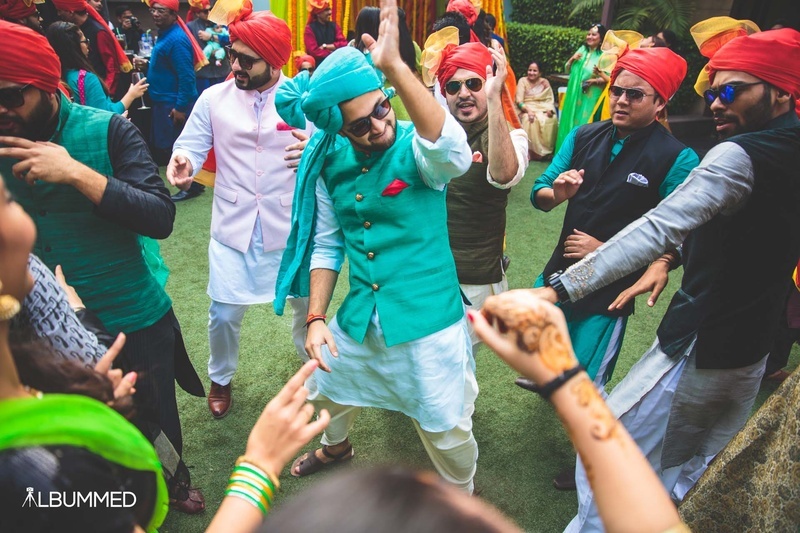 They hit it off like ‘house on fire’. 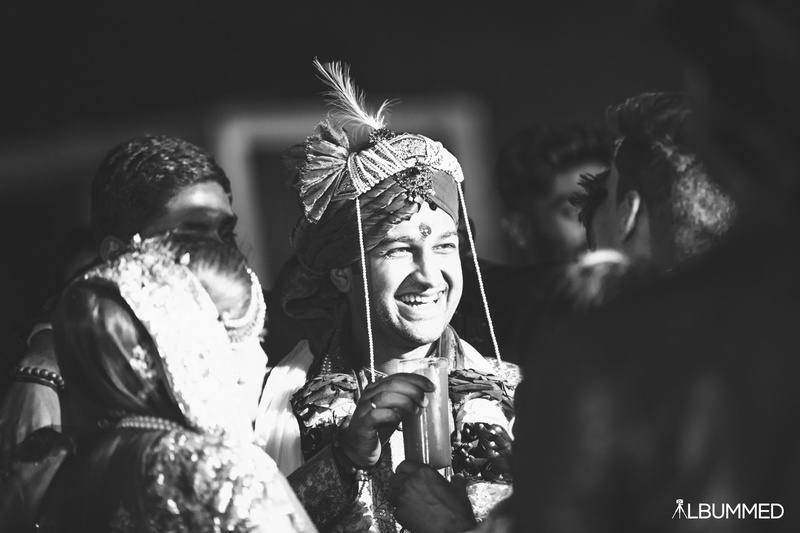 Even before they knew it, they were head over heels in love with each other. 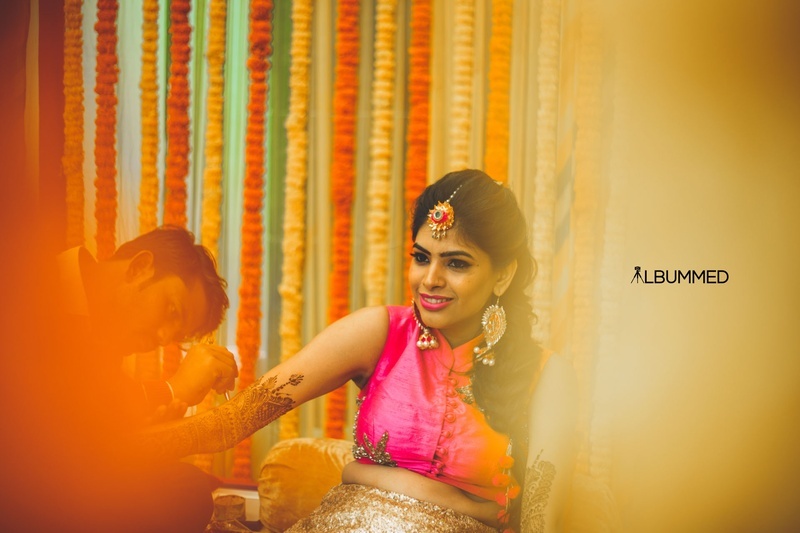 While you enjoy the cute and fun love story of Arpita and Vedant shot by Albummed, don’t forget to find a little bit of yourself in their story. 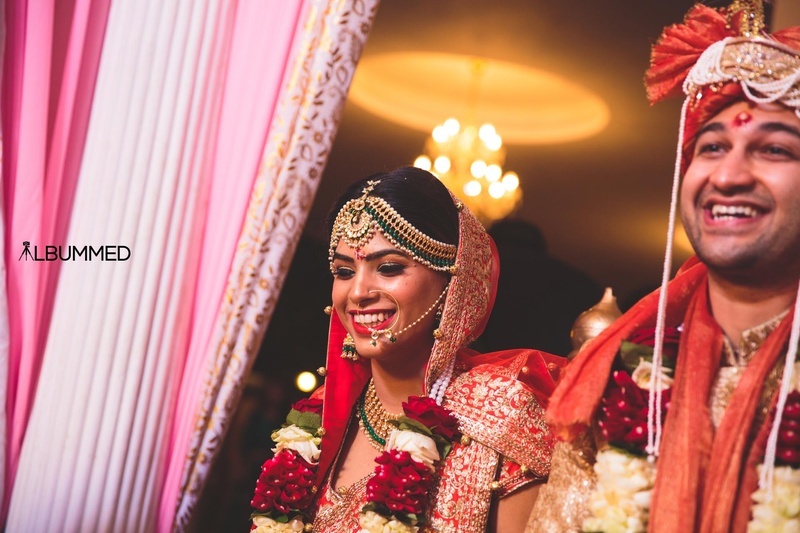 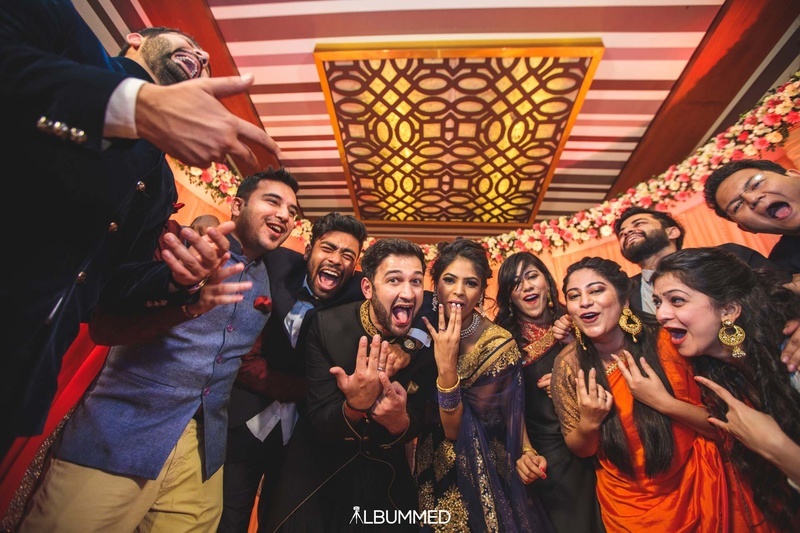 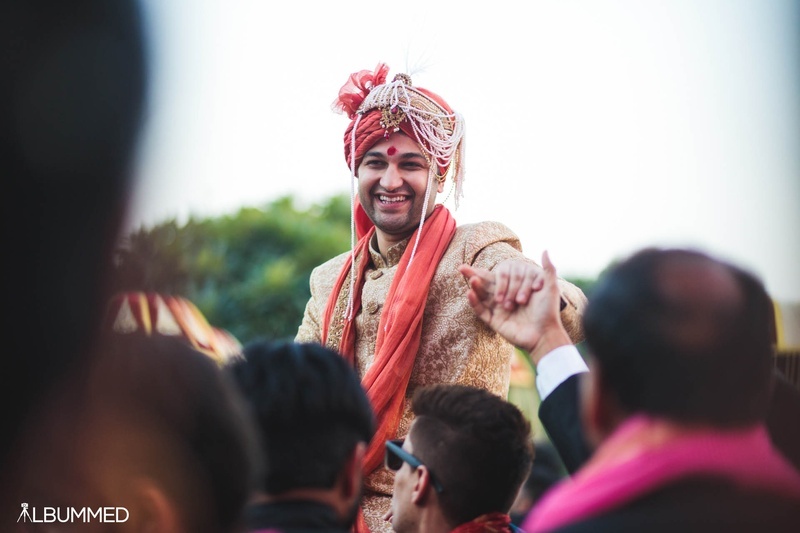 Arpita and Vedant: Happiness is marrying your best friend from Albummed on Vimeo. 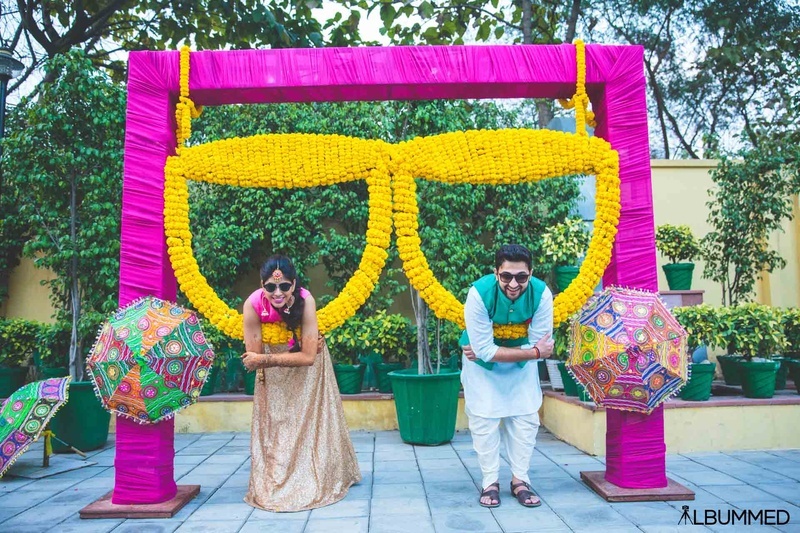 Quirky decor setup for the sangeet ceremony held at City Park, Gurgaon. 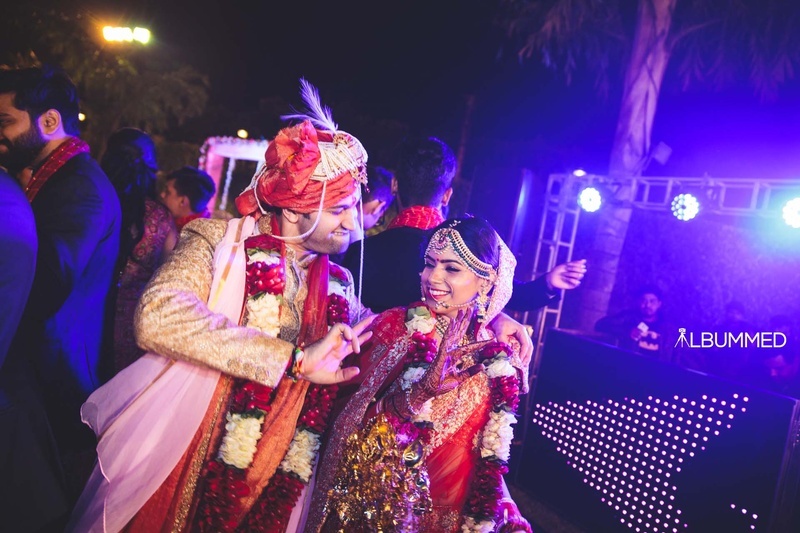 Arpita and Vedant on their sangeet day! 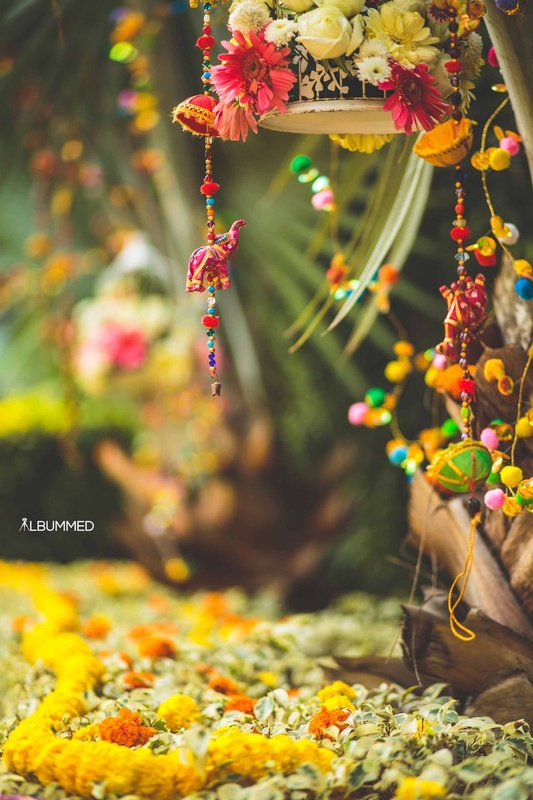 Genda phool decor for the mehendi ceremony held at City Park, Gurgaon. 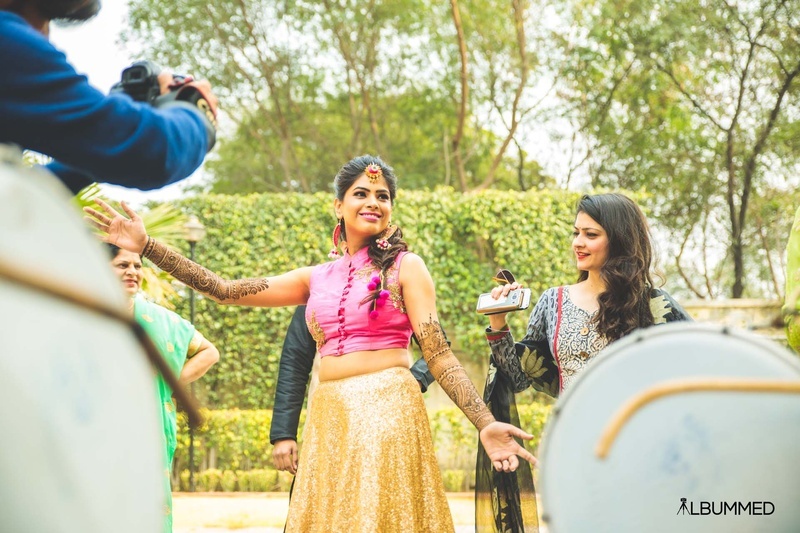 Dressed up in pink and gold skirt lehenga paired with floral gotta patti jewellery for the mehendi ceremony. 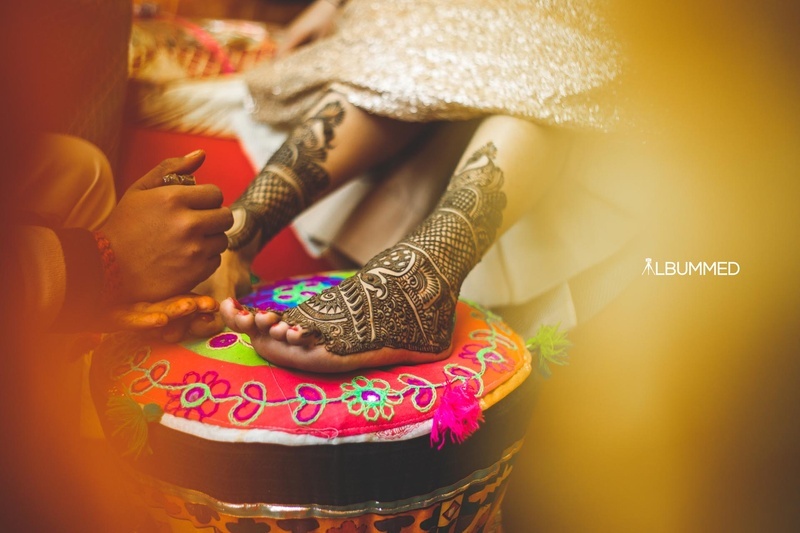 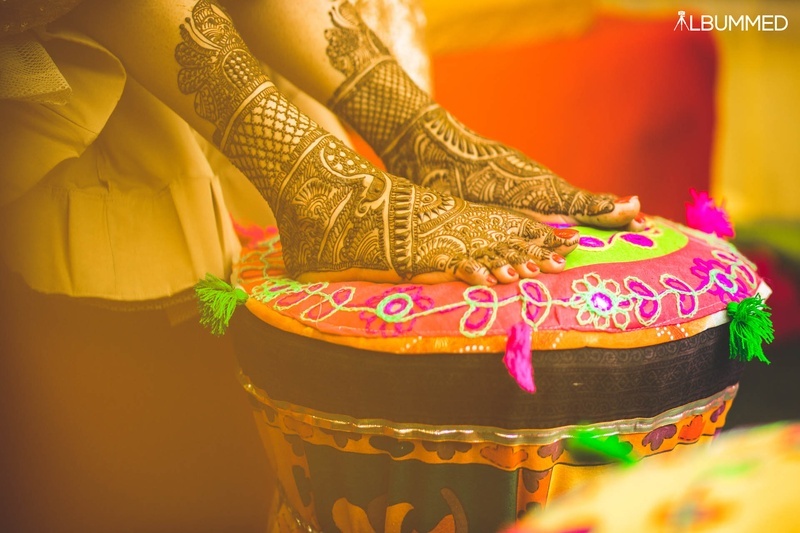 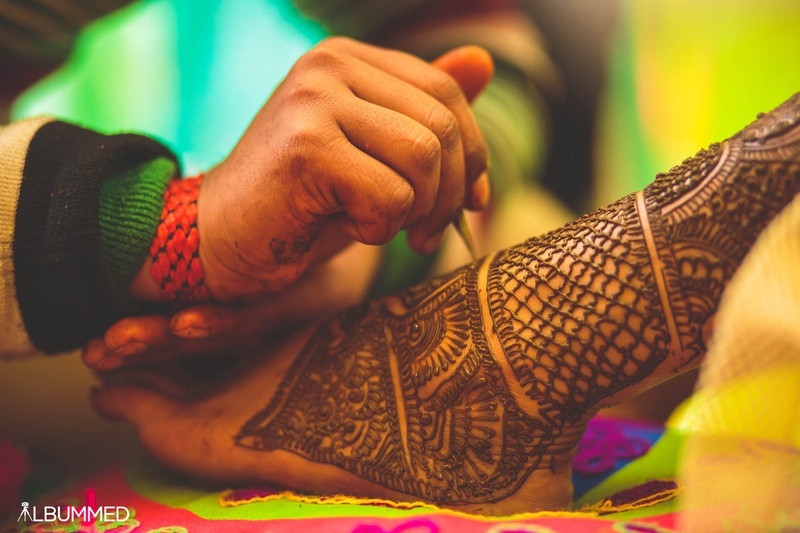 Foot filled with intricate mehendi designs! 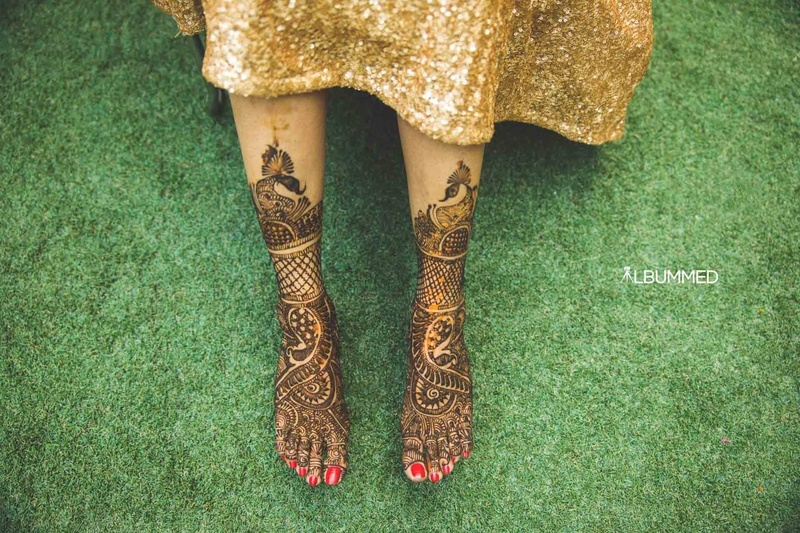 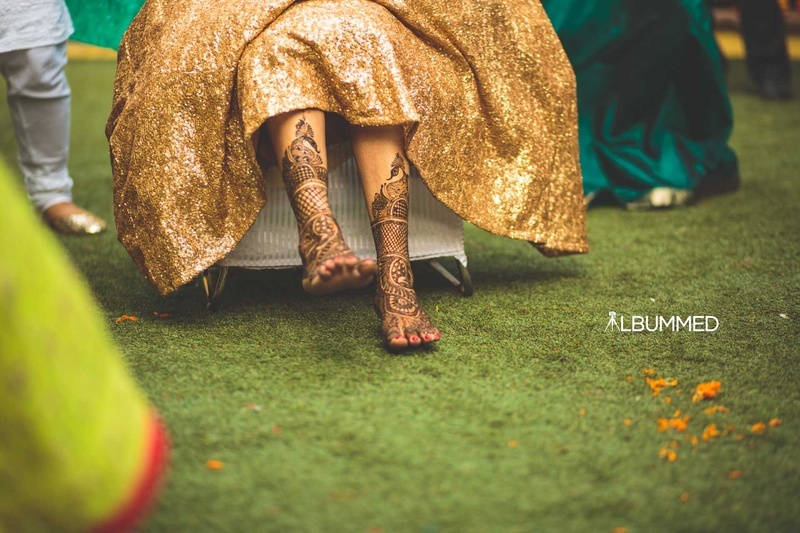 Inticate and beautiful feet mehendi designs. 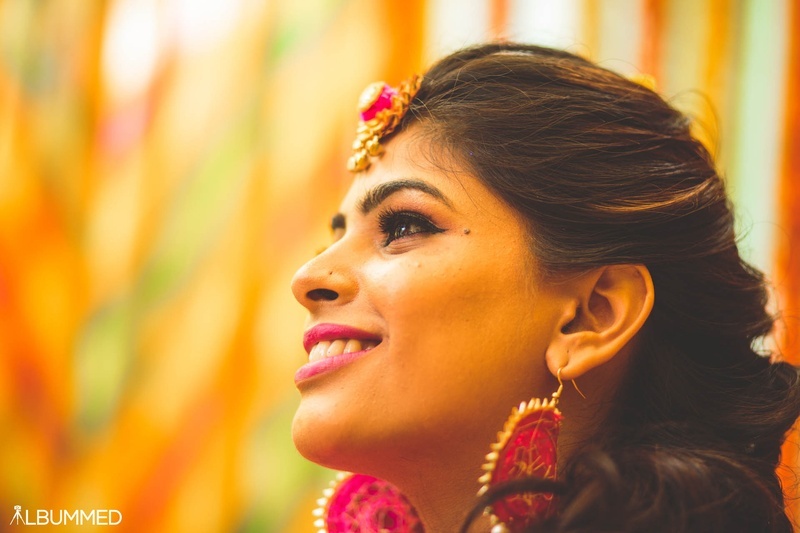 Floral gota patti maang tikka and earrings! 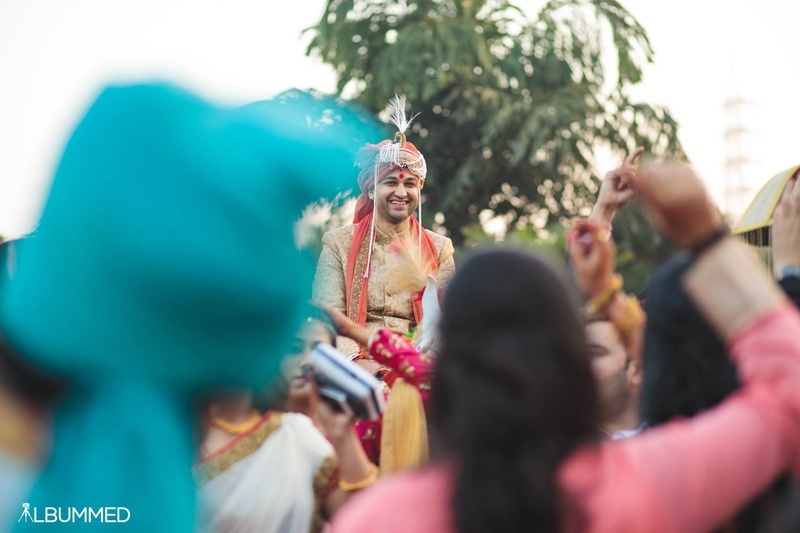 Vedant dressed up in a turquoise blue bandhgala. 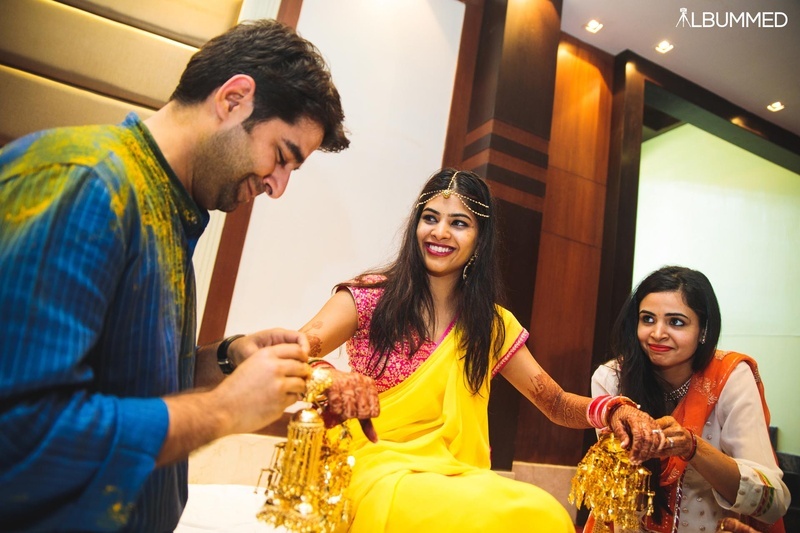 Holi themed mehendi ceremony held at Park city, Gurgaon. 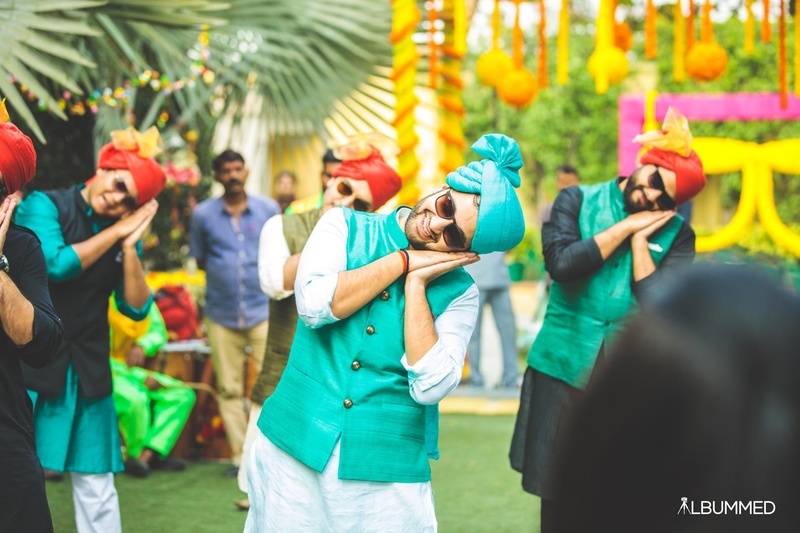 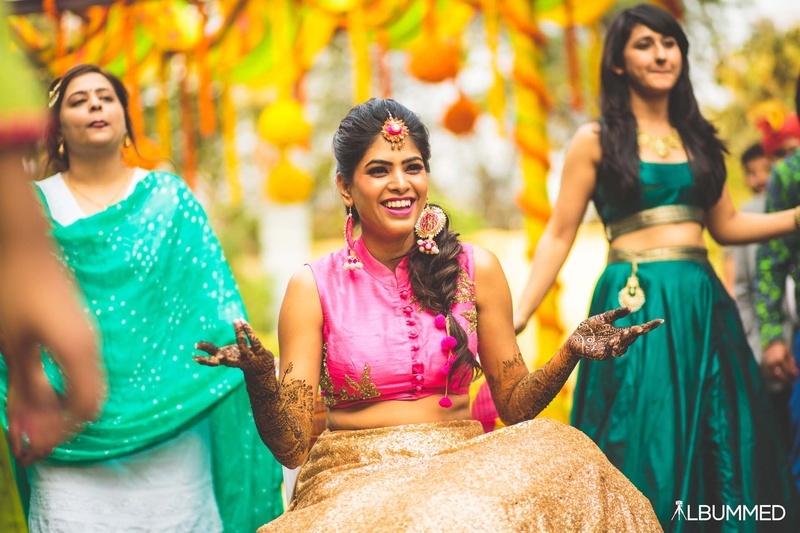 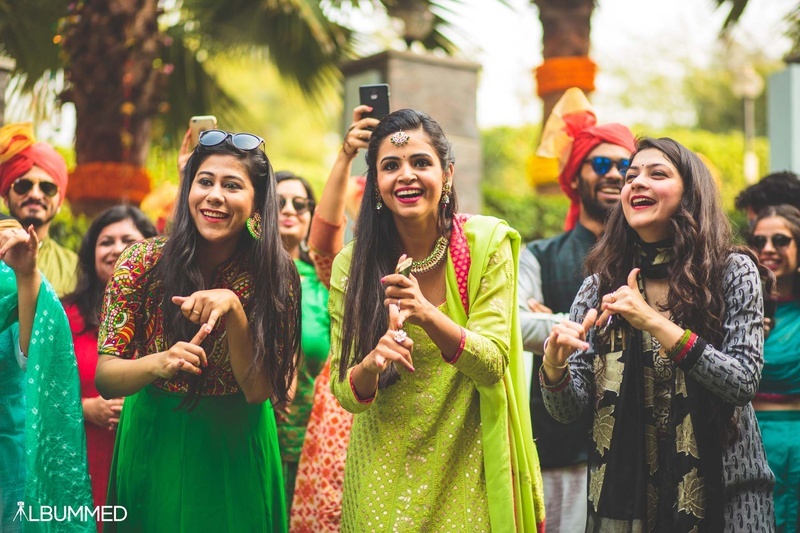 Vibrant and fun mehendi ceremony. 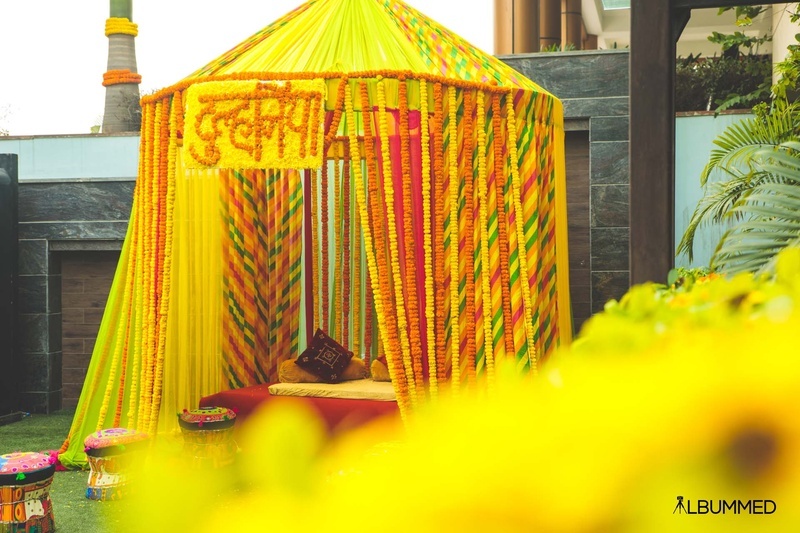 Genda phool decor ideas for your mehendi ceremony. 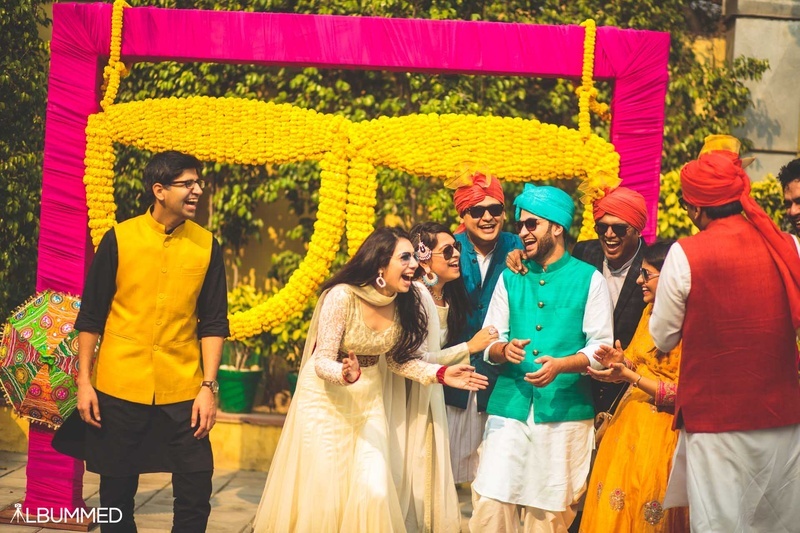 Dressed up in a palin yellow saree paired with hot pink embroidered blouse for the kaleere ceremony. 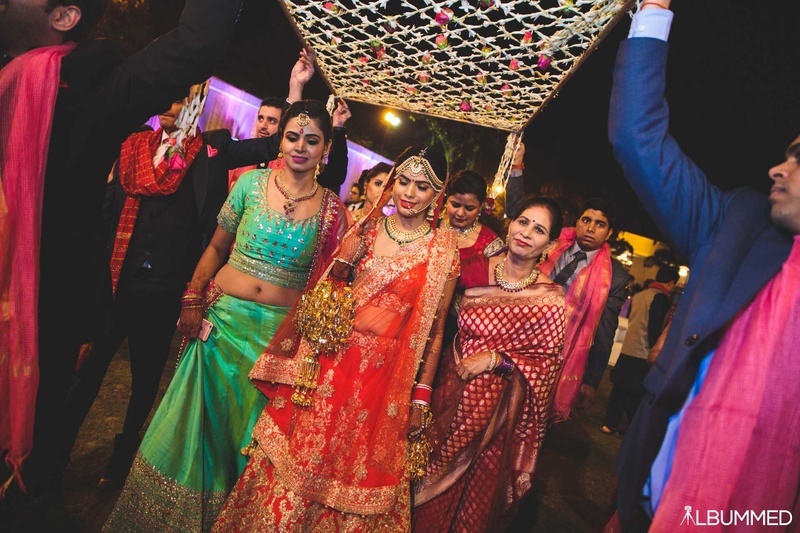 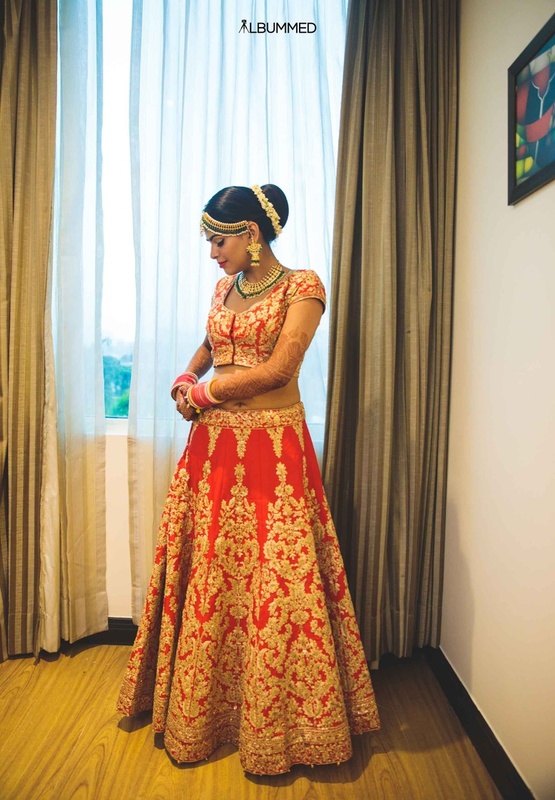 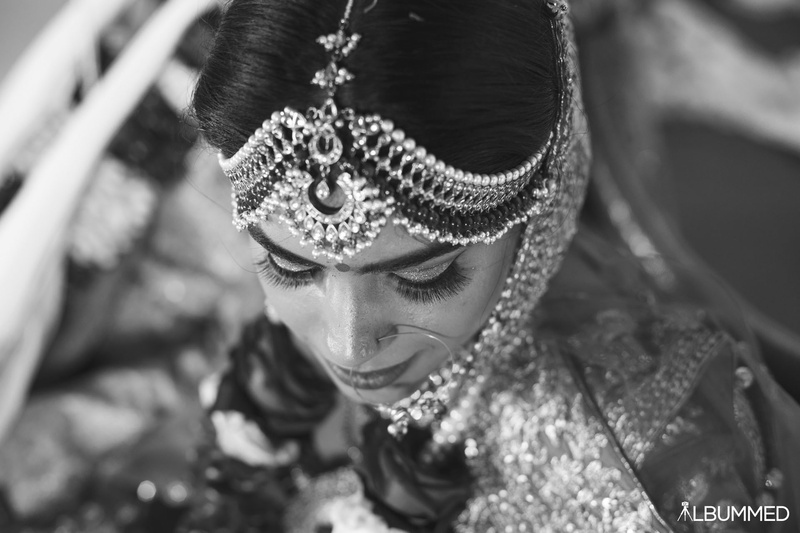 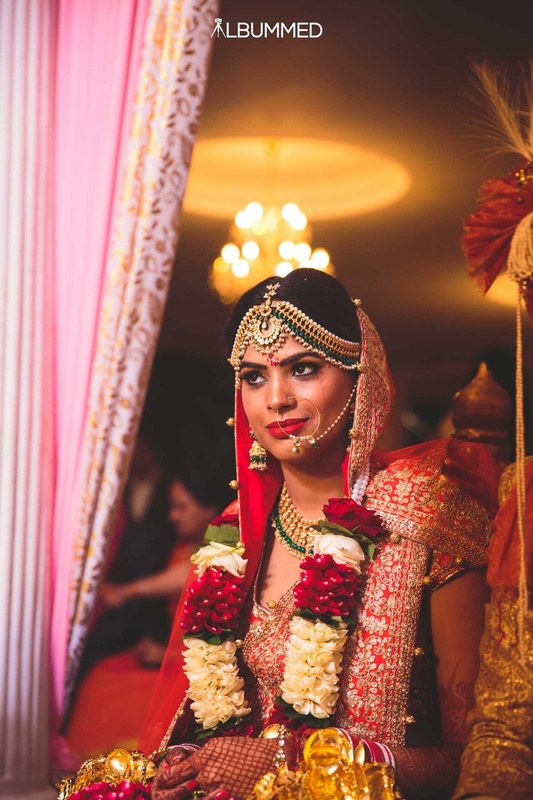 Bride getting dressed up in a beautiful intricate embroidered red and gold lehenga. 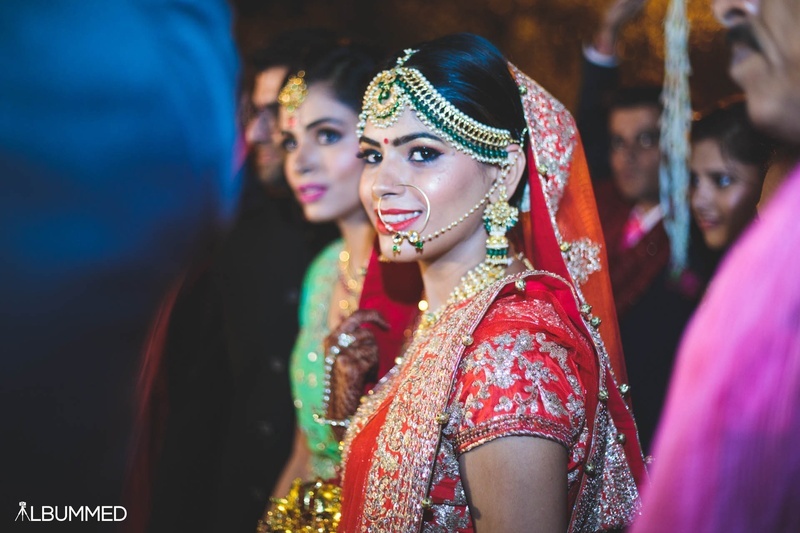 Olive green and gold jewellery for the wedding day. 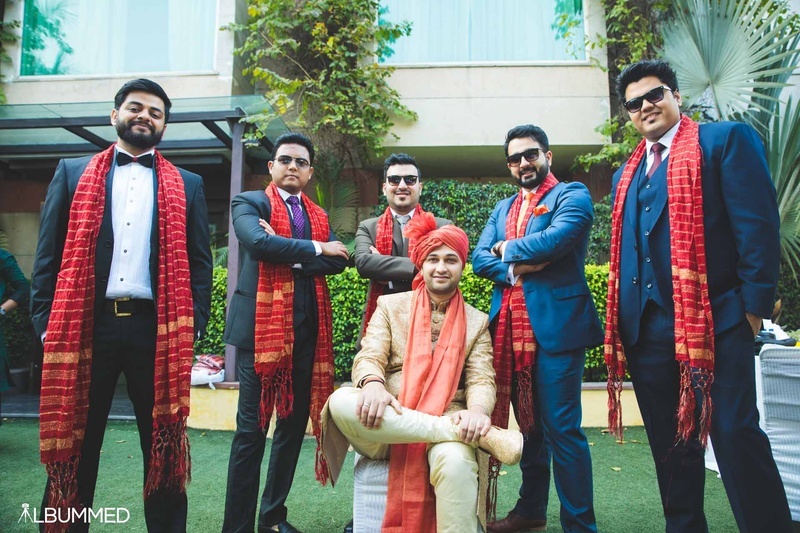 The dapper groom and his best men! 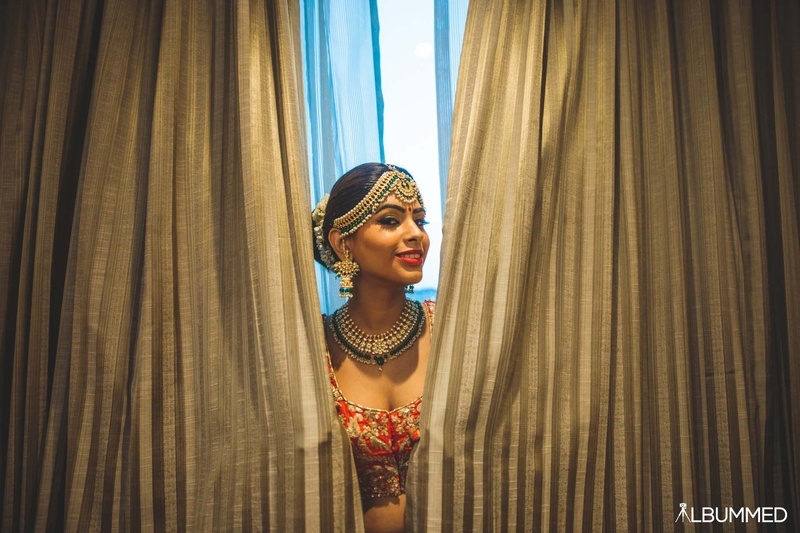 Bride dressed up gorgeously entering the wedding ceremony. 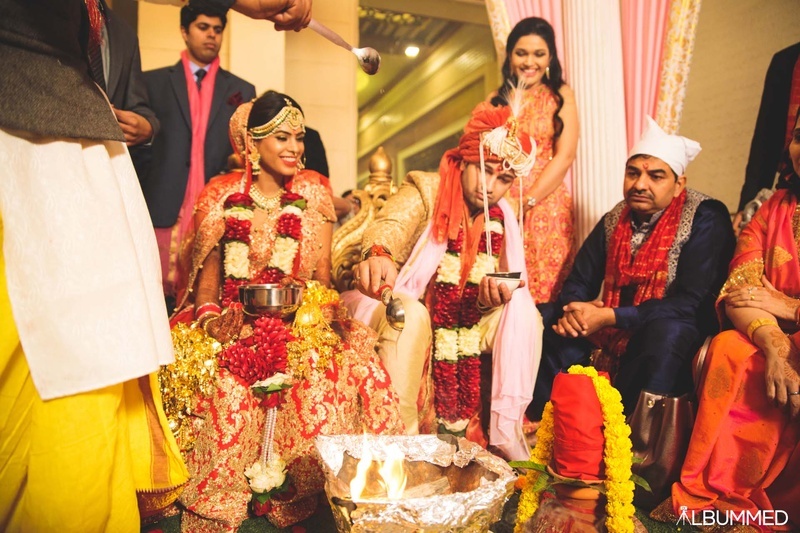 Varmala ceremony held at city park hotel, Gurgaon.